Well, it's still early in the season, but it's not too soon to take a look to see how things stand in Reds land. It appears that Reds fans have at long last have successfully paid their penance for whatever offense was given to the baseball gods, because Cueto is the pitcher for whom we've been waiting over two decades. His blend of power and control ranks with the very best. On the season, Johnny has a 29/3 strikeout-walk ratio, which portends very well for his future success. Patterson was bizarre acquisition when he was making zero money. 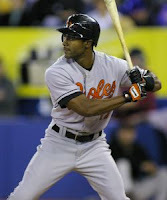 Unfortunately, it came out that by making the MLB roster, Patterson's salary increased to $3M in 2008. It seems an odd signing at that price, because Patterson had no other suitors for his service. Unfortunately, even given Patterson's declining production, he's unlikely to lose his starting job any time soon, as he's a Dusty guy and his salary gives him a lot of leeway. While it is still early, Volquez has been impressive. He has the stuff to be a top of the rotation pitcher, but in the past when he hasn't had his good stuff on a given day he hasn't been able to hold it together. He was all or nothing, but this season he is doing a better job of grinding it out with less than his best stuff. Ideally, Edinson will have his good stuff on most days, but it's comforting to see that he can keep the team in the game when nothing is working for him. Consistency will continue to be a problem, but for now he is throwing well. Sadly, at this point it is clear that Arroyo's stellar 2006 season was the exception, rather than the rule. Unfortunately, the Reds paid Arroyo on the basis of his 2006 season. Given Arroyo's lackluster 2007 and his poor start to 2008, it would seem that Arroyo is only the 4th best pitcher on the staff. At this point, Bronson is a solid, inning eater and nothing more. Krivsky's decision to extend Arroyo's contract was a poor one. 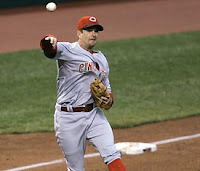 Arroyo was locked into a below market contract, but the Reds extended him and brought his salary up to the going rate. 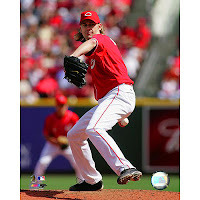 The decision was a clear knee-jerk reaction to the Reds perennial lack of starting pitching, but with the good young arms coming up through the system, Arroyo is becoming overpaid and underproductive all at the same time. Votto is off to an encouraging and (possibly) discouraging start. On the year, Votto is hitting the ball very well. His batting average is .326 and he is slugging .605. All of which is great, but oddly enough he has yet to walk in 43 ABs. It could be nothing but a sample size issue or it could be indicative of Votto buying into Dusty's "suggestion" that Votto get more aggressive. Personally, I'll hope for the former, instead of the latter, but it certainly bears watching. If Votto has really changed his approach in order to secure more playing time, then it could cause problems down the road. As to be expected, Edwin continues to battle inconsistency. Unfortunately, any benefits of his bat have been offset by his weakness with the glove. He already has 6 errors on the season and his offensive production hasn't been all that impressive. It is becoming more and more clear that Edwin is not a third baseman, which puts the Reds on the horns of an interesting dilemma. They don't have anywhere else to play Edwin, so I'm not sure what will happen. Kepp just hits and hits and hits. He's remarkable and has certainly made a strong case for a starting job when A-Gon gets back. At this point, it looks like Kepp will steal Edwin's job. One of the more interesting developments in baseball analytics these days is the emergence of pitch data. New data is emerging that reveals pitch movement, a pitcher's release point, and the usage patterns of each pitcher. This kind of data really can reveal how a pitcher does what he does. The mix of pitches he employs and his strategy for attacking hitters. So, without further ado, here's a glimpse of how the Reds starters worked in 2007. Personally, I didn't realize just how heavily Aaron Harang relies on two pitches. He throws a fastball, slider, and a show-me curveball. Not to mention, his fastball velocity isn't really anything to write home about, as on average his fastball clocked in at 90.73 MPH. In 2007, 66.52% of his pitches were fastballs, 29.66% sliders, and 3.82% curveballs. Usually, when you hear about starting pitchers, you hear about how they need 3 or 4 pitches to be successful. 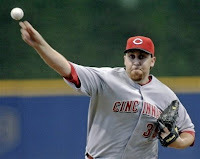 Aaron Harang succeeds largely with just 2, which is a tribute to his command and pitching IQ. When he gets into a 2 strike count, he relies heavily on the slider. When it was 0-2, Harang throws a slider 53.28% of the time. When it was 1-2, Harang threw a slider 57.36%. When he got into a hitter's count, he relied mostly on the fastball. When the count went to 2 balls, Harang threw almost exclusive fastballs. When it was 2-0, Harang threw a fastball 87.88% of the time. When it was 2-1, Harang threw a fastball 84.38% of the time. When it was 2-2, Harang threw a fastball 50.55%. Harang may not have the most diverse offerings, but he certainly gets the job done. Arroyo is very different pitcher from Harang. He's more of an "everything but the kitchen sink" type pitcher. Arroyo throws four different pitches, including a fastball, curveball, slider, and changeup. He relies heavily on mixing his pitches and throws all four with great frequency. In 2007, Arroyo threw a fastball 42.75% of the time, a curve 15.61% of the time, a slider 19.01% of the time, and a changeup 22.63% of the time. It's a much more diversified attack employed by Bronson. Against righthanded hitters, Arroyo relied more heavily on the slider (25.04%) than the curveball (9.53%). Against lefties, Arroyo relied more heavily on the curveball (22.19%) than the slider (12.48%). This seems counterintuitive to me. Given the common wisdom that lefthanded hitters like the ball down and in, it would seem likely that the slider is the better choice. Evidently common wisdom isn't so common or wise. Oddly enough, Bronson preferred 0-2 pitch is the fastball (61.18%) followed by the slider (29.41%). When Bronson got to 2 ball counts, he didn't have a strong preference, but rather threw just about everything. Arroyo is confident in all his pitches and it shows in his pitch selection. He's not dominant, but his ability to throw anything at just about any time is a big key to his success. Fogg is another pitcher with a diversified 4 pitch arsenal. He features a fastball (88.15 mph), sinker (88.21 mph), slider (77.99 mph), and change-up (81.39 mph). He also relies fairly heavily on all four pitches. Given the low velocity on the fastball, it would seem likely that he would benefit from taking more speed off his change-up to increase the difference between the two pitches. In 2007, his pitch breakdown looks like this: fastball 47.83%, sinker 14.16%, slider 12.74%, and change-up 25.28%. He threw fastballs 60.23% of the time against righties, but only 33.91% against lefties. On the other hand, he threw sinkers 9.18% of the time against righties, but 19.74% of the time against lefties. He also threw many more change-ups against lefties (37.98%) than righties (13.96%). In 2 strike counts, Fogg relied heavily on the fastball, slider, and change-up, but rarely threw the sinker. In 2 ball counts, Fogg relied heavily on the fastball and changeup, but almost never threw the slider. Given his overall performance, Fogg may be advised to utilize a different pitch mixture. Or, maybe his attack strategy is perfect, but his stuff just isn't good enough to get the job done. Edinson features a 3 pitch mix. He works with a fastball (94.46 mph), curveball (80.39 mph), and change-up (83.33 mph). Edinson clearly has good hop on the fastball and a nice 11 mph difference between the fastball and change-up. 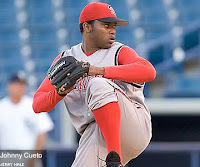 In 2007, Edinson had the following pitch mix: 64.78% fastballs, 23.2% change-ups, and 12.03% curveballs. He had good success against lefties, even though he relied almost exclusively on the fastball (67.7%) and change (22.68%). He didn't throw the curveball much against lefties (9.62%). He used all three pitches against righties hitters. Clearly, Edinson is having much greater success in 2008 than he did in 2007, so it'll be interesting to see if he's using a different pitch mix or strategy. In 2 strike counts, Edinson utilized a similar pitch mix to his overall percentages. He doesn't seem to feature a real out pitch, but rather seems to use all of his pitches as out pitches. Unfortunately, for obvious reasons, Johnny Cueto doesn't have any pitch data, but it'll be interesting to see how he goes about his business. The Reds have several different kinds of pitchers, so it's interesting to see how they attack hitters. The Reds starting pitching is much improved thus far, so let's hope they continue to succeed, regardless of how they do it. Well, it's been an interesting week in the Reds nation and I've got a few random thoughts about our Redlegs. ***Interesting to read that upon making the MLB roster, Corey Patterson's salary jumped to $3M. When he was set to make the minimum, he seemed like an all reward, no risk type player. A mere stop gap until Jay Bruce was deemed ready to take over. 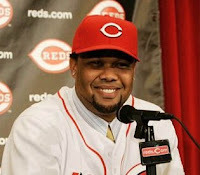 However, it's difficult to imagine the Reds making him a bench player and promoting Jay Bruce. Ryan Freel is making $3M in 2008, but his versatility really extends the bench and seems to make him a good value. But, would the Reds and Dusty Baker really put Corey Patterson and his $3M on the bench to make room for Jay Bruce? Patterson is clearly a Baker favorite, so it seems unlikely that he'd favor moving him to the bench for a young prospect like Jay Bruce. And, I'm not sure Krivksy is going to be all that eager to have $3M sitting on the bench. Given how this is playing out, I'm not sure I'd expect to see Jay Bruce prior to September, unless of course injury strikes Dunn, Patterson, or Griffey. And, at this rate, I could easily see Patterson being brought back in 2009 to again play center. 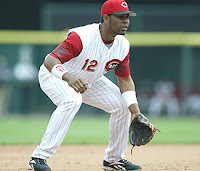 The Reds will have to make some interesting decisions this offseason about their 2009 outfield, as both Griffey and Dunn could potentially be gone. As it stands, Patterson may be a better bet than either of them to return for 2009. ***Jeff Keppinger just continues to rake. There really isn't much more to say, as Keppinger continues to prove that he could roll out of bed at hit .300. The Reds have a problem, a pleasant problem, but a problem none the less. Keppinger continues to prove that he deserves a starting job, but they've got no room for him. 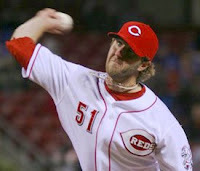 If the Reds tire of Edwin's inconsistent play, then they could deal him and plug in Keppinger without losing much. Until that time, Keppinger will continue to be a tremendous backup at second base, third base, and shortstop. His presence gives the Reds great depth. ***Johnny Cueto was just tremendous. We couldn't have asked for anything more out of him. 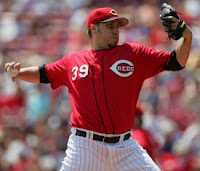 Ultimately, he may prove that the Reds fans' long winter of pitcher development is finally over. In addition, his arrival may provide Homer Bailey the opportunity for some much needed development time. At this point, Homer needs to spend the entire year in AAA. He would be out of the limelight and could work on both his command and control. At this point, he just isn't ready. Thankfully, the same can't be said of Cueto. ***Aaron Harang is a two pitch pitcher. I'm not sure why I didn't realize it, but Harang works almost exclusively with a fastball and slider. In 2007, 66.52% of Harang's pitches were fastballs, 29.66% were sliders, and 3.82% were curveballs. The average velocity of his fastball was 90.73 mph. Clearly, Harang doesn't make pitching more complicated than it needs to be. He has very impressive command and uses good pitch sequences to get top notch results. In a day and age when starters are often required to have 3 pitches and many utilize four or more, it's interesting to see how effective Harang can be by keeping it simple. ***Bronson Arroyo features four pitches. In 2007, Arroyo threw 42.75% fastballs, 22.63% changeups, 19.01% sliders, and 15.61% curveballs. He used the curveball primarily against lefthanded hitters and the slider primarily against righthanded hitters. His fastball velocity is only 89.39 mph, but he understands how to get the most from his repertoire. ***So far, Dusty hasn't overworked anyone. He kept Harang under 100 pitches in his first start and under 110 in his second. Given the climate of the modern game, he won't be able to get away with heavily overworking his pitchers, but it's nice to see that he hasn't attempted to do so. 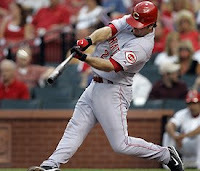 ***The Reds current sit at 3-2, twice earning good victories over the D-Backs and once over the Phils. The schedule certainly hasn't been kind to the Reds, as they start out against three very good teams in the D-Backs, Phillies, and the Brewers. Things let up after they leave Milwaukee, as then they'll head to Pittsburgh. ***Stop the press!!! 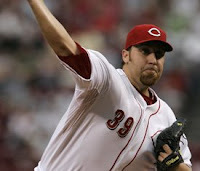 In 2008, the Reds bullpen has a 3.21 ERA and a 1.14 WHIP. If the Reds can be consistent late in ballgames, then they are already ahead of the game. ***Overall, the Reds have started out the 2008 season in fine form and have even put together a couple of walk off wins. I don't know why, but nobody does walkoff wins better than the Reds. Well, it's hard not to be blown away by what Johnny Cueto accomplished today. In case you missed it, or just want to see it again, here's a clip of his work in the 2nd inning of today's game. Thanks to daburkey06 for providing it. Enjoy, Reds fans, enjoy. We've certainly earned it!!!! Well, another Opening Day has come and gone. The Reds drew a tough assignment in Brandon Webb and the Diamondbacks so you can't draw too many inferences, but a few observations. 1) Dusty passed his first big test, as Aaron Harang was only allowed to throw 99 pitches. Joe Posnanski recently wrote an interesting article about young pitchers, workload, and 300 wins. In it, Posnanski talks about C.C. Sabathia and the likelihood that he'll reach 300 wins. He illustrates how rare it is that a young starting pitcher who racks up a lot of wins at a young age will go on to win 300 games. Posnanski talks about the success of some young pitchers and then goes on to discuss innings pitched for these young guys, a discussion that inevitably turns to Dusty Baker, Mark Prior, and Kerry Wood. He goes on to state the obvious, that Prior and Wood were heavily overworked. That's nothing new and doesn't really need to be rehashed, but the interesting thing is that Posnanski doesn't believe that that kind of abuse of young pitchers would be tolerated in the present game. I tend to think he's right. It really hasn't been that long since Baker managed the Cubs, but Posnanski is right in that the entire baseball culture has really changed. You could see signs of it when the hiring of Baker was announced. You could see signs of it in the scrutiny of the hiring by the Cincinnati media. At the time of the hire, about the only thing that gave me comfort about handing over young pitchers to Dusty was that the increased scrutiny from the media might FORCE him to change his managerial style. I have no illusions that Dusty would change on his own, but the spotlight from the scrutiny that would result would likely be too hot even for Dusty to handle. The early returns are good, but I really don't think the fans, media, or front office would tolerate heavy workloads on the starting pitchers. The baseball culture and mindset have evolved to the point that it won't be tolerated any longer. 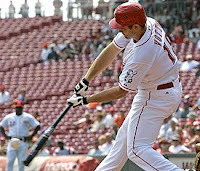 2) Scott Hatteberg got the nod over Joey Votto. Again, it's one game, so maybe this doesn't mean anything, but it has to be noted. Dusty went with the veteran over the young guy. At this point, Votto isn't a young prospect any more. The bloom isn't off the rose by any stretch of the imagination, but it's time for him to get his opportunity. This is his 24/25 year old season and he doesn't have anything left to prove in the minors. He tore the cover off the ball in the minors last year and carried it over to the majors in September last year. Don't get me wrong, I love Scott Hatteberg. He may have the best plate approach of any hitter in baseball and I wish I could graft that approach onto every Reds hitters. His control of the zone matches that of any hitter in baseball. That said, at this point, Votto's DOWNSIDE is likely equivalent to Hatteberg's UPSIDE. Unfortunately, both are left handed hitters, so a platoon isn't a viable option. So, in short, it has to be one or the other. At this point in their careers, it's clear that it has to be Votto. He's got more power and almost comparable on base skills. Hatteberg is only going to get worse, while Votto is only going to get better. The Reds need to plug Votto into the starting lineup and let him play. Any plan to share playing time is going to be detrimental to the Reds and Votto. I love Hatteberg, but like all first basemen without power, the time inevitably comes when they no longer make sense for the team. A younger, better option comes along and it's time to part ways with the established player. That time has now come for Hatteberg and the Reds. The Votto era has begun. 3) Edwin started out with an error. Edwin had a terrible spring, which isn't a good sign. I don't put much stock in spring training stats, but I would've preferred a strong spring from Edwin. From my point of view, it's truly "put up or shut up" time from Edwin. I've heard all the excuses and, in fact, used to subscribe to them. Edwin had been bounced in and out of lineup so often by the manager that he had diminished confidence and tentative play. That all sounds well and good, but at some point it's up to Edwin to grab every opportunity to prove his worth. Guys like Jeff Keppinger and Brandon Phillips make the most of every chance they get. Phillips grabbed the second base job and never looked back. Keppinger has given the Reds no choice but to keep him on the roster and, in fact, he's making a strong case for a starting job. Then, we get back to Edwin, who makes the least of his opportunities. No more excuses, it's time for Edwin to prove his worth. 4) The Reds may have something with their late inning relievers. The Reds have been undone by their bullpen the last few seasons, so to see fairly smooth sailing from the 7th (Burton), 8th (Weathers), and 9th (Cordero) is more than a little encouraging. True, Burton gave up a solo homerun, but these three could provide some much needed stability in the late innings. Burton was truly dominating in the second half last year and his ability to maintain that kind of production would have a huge impact for the Reds this year. People studying the new Pitch Data have drawn comparisons between Burton's fastball and Mariano Rivera's famous cut fastball. All in all, the bullpen is off to a good start. If the Reds could hold onto late inning leads, then it would go a long way towards building up team morale and improving the W/L record. At this point, things are looking up.